“A new course exploring the Occupy Movement and the political-economic order it is challenging is being offered this spring at Roosevelt University’s Chicago Campus. 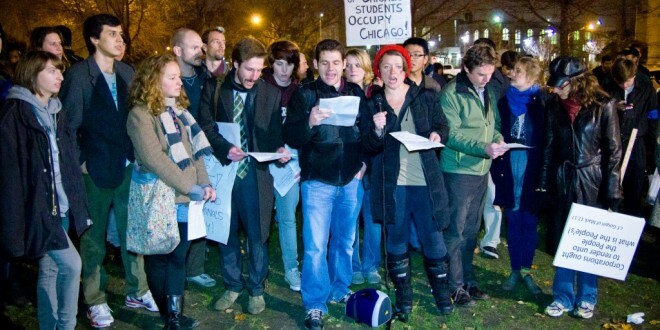 Thirty-two undergraduatres [sic], including several who are involved with Occupy Chicago, are taking the course, Political Science 390, Special Topics in Political Science: Occupy Everywhere, with Jeff Edwards, associate professor of political science and an expert in social movements. “It is exciting and timely to look at a movement as it unfolds in its early years,” said Edwards, who got the idea for the course in response to the ongoing debate in America’s academic political science circles over the impact that growing socio-economic inequalities are having on U.S. democracy. During the course, students are reviewing literature, essays and articles about the Occupy movement that began in 2011; they are looking at considerable research that’s been done in the area of socio-economic inequality and democracy; and they will be doing their own research on various aspects of the Occupy movement. According to Edwards, various aspects that could be studied could include: historical comparisons of Occupy to other social movements; racial dynamics of Occupy, including how the movement allies itself with other communities and causes; Occupy as a global movement, and its potential for changing politics globally; Occupy’s future, including strategies/directions that the movement could take in the future; and Occupy’s potential impact on the 2012 U.S. presidential election. For more information, click here to view the course’s contact information. Photo Credit: Darren Leow, The Chicago Maroon.